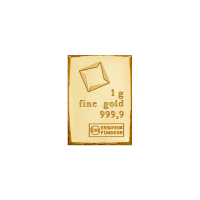 These 1 g bars are 50 g Valcambi Gold CombiBars broken into 1 g increments. Zlatý díl CombiBar Cambi 1 g These 1 g bars are 50 g Valcambi Gold CombiBars broken into 1 g increments. CombiBars offer an exceptional investment value, as well as a practical one. Each 50 g CombiBar is manufactured with accurate predetermined breaking points, therefore making each smaller 1 g increment in perfect condition and without any loss of material. This makes it possible to sell only a portion of your 50 g bar.